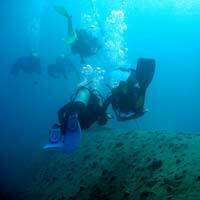 For the purposes of this article, let’s assume that you’ve firstly understood the type of equipment you’ll have needed to purchase and/or adapt for underwater filming and that you know how to care for your camera after filming has finished. As a video maker, it will also be given that you will understand how water can affect light perception etc. This article, therefore, is more focused on the kind of compositions of images and techniques you can use to create a more interesting and dynamic underwater film. No matter how clean a sea or other body of water might appear on the surface, filming underwater can often result in a final video which basically resembles silhouettes and background shapes amidst a murky body of water often resembling a snowing effect because of the water particles which are magnified even more on camera. Water can also have an optical illusionary effect making objects seem closer than they actually they are so it’s important to get as close as possible to the object(s) you’re actually trying to shoot. This should not be a problem if you’re filming things like a coral reef or inanimate objects but if you’re shooting live creatures such as fish, try to get to within 4 to 6 feet of the subject(s). This might not always be possible but the closer you get to what you’re trying to film, the less any optical distortion and less water particles between the lens and the subject giving you a much better visual of the subject. Swimming alongside the creature if you’re able to keep up will also give viewers a sense of speed. If you’re filming a creature that’s moving underwater, and this could include a human as well as a fish or other kind of marine life, shooting upwards from beneath the subject provides the viewer with a sense of both the size and depth of the creature whereas shooting from above the subject simply flattens the subject out and does not give the viewer a sense of being able to compare the creature to others which are in the film too. Just like with any other form of film making, maintain your viewers’ interest by varying the angles from which you shoot. Wide angles are good for establishing the scene but mix them up with close ups too and also bear in mind to vary the kind of action shots you’re filming. Simply following a fish from behind doing what comes naturally to it – i.e. swimming, is all well and good…..well, for 10 or 20 seconds or so but you need to also focus on the behaviour of the fish as well as any beauty or interesting visual characteristic it might have. A rare marine creature that has not been filmed all that often might hold and enthusiast’s interest for a short time but not for long unless it’s DOING something. Far better to capture shots of fish battling for supremacy over a feed or burrowing into sand searching for food, for example. The zoom lens, whilst being used sparingly, is also a good effect to have to add emphasis to a particular subject and will also help you get up closer to those creatures which may not allow you to get as close as within a few feet. No matter how good a film maker you think you are, filming successfully underwater and producing results which have clarity and are interesting to the viewer are not as easy to make as you think and it is only through patience and practice that your films will take on more of a professional quality. Even better, as you’ll be an accomplished diver in the first instance to be able to film underwater, many diving schools often have the facilities and contacts to be able to offer you courses in underwater videography so if this is something you’re seriously interested in, professional instruction from a specialist in this field would be extremely invaluable.